My training is as an artist/sculptural engineer, wood craftsman, and a dozen other fields related to the of creation of objects. I use the same design methods the Aleuts and Inuits used, a lifetime of experience on the water in all kinds of small boats, looking and studying small boats, in a multitude of white water and sea conditions. 30 years ago, I started designing kayaks for myself. I was already building stripper canoes and I wanted a sea kayak, so of course I would build one. But what and where would I come up with a design. I could look at the kayaks available commercially for a design. Then I remembered an art historian from my training in college saying, "Most everything we see today, is just the shadow of some inspiration from the past." So I thought, go to the source, the drawings of indigenous arctic kayaks. Thousands of years of experience and on the water design development. Where could I find a better design source? We all stand on the shoulders of others, choose well. I hope you will look at my designs, read the information I provide, read the testimonials on my site and call me to talk to me personally, so I can suggest a boat for your needs and skills. I'm asked about numbers generated by cad programs to define my designs. I don't design that way so I don't offer those numbers. There is a saying about computer programs "garbage in garbage out." The same is true of cad boat design. Where are other designers getting their ideas? Cad programs were developed to design large boats. There is no money for research or design of small boats. Information, modeled from CAD programs for large boats, is not as relevant in the dramatically different proportional effects small boats encounter, which experience MUCH greater differences in: paddler weight, boat weight, weight distribution of cargo, fresh or salt water, and relative wave heights to boat size. Numbers derived from boat design cad programs for conventional hulls are meaningless in reference to baidarkas. You can't compare apples and oranges. Baidarkas are very different in handling compared to Greenland based designs. Even in the moderate conditions recreational paddlers incounter there is a noticable difference. Baidarkas are designed for windy conditions and riding big waves. They do not weathercock, or broach in a following sea, like Greenland designs. Baidarkas become more stable in rough water due to the volume and flair of the hull carried all the way to the stems. This design is tuned for surfing big waves, to travel long distances expending minimal energy. Baidarka volume carried fore and aft gives these kayak much greater carrying capacity than ANY equivalent Greenland based design of similar length. Aleuts paddled year round in seas that never froze. Aleuts worked in groups to chase down mammals. The Aleutian Islands are on a latitude similar to Belfast, Ireland. The warmer northern Pacific crashes into the cold Bering Sea along the Aleutian archipelago which is still some of the richest sea life in the world. Abundent food sustained the Aleut but extreme conditions tempered them. To this day King crab fishermen risk and loose their lives here every year. These Aleut home waters average 8-12 foot waves during summer and 15 to 25 feet in winter. Their iqyax (baidarka) was designed and tuned to surf waves so they could travel great distances while conserving energy. 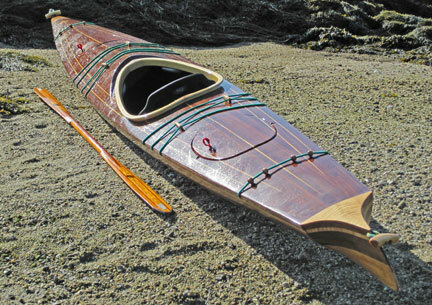 The great speed attributed to the baidarka design, in historical records of Pacific explorers, is witness to surfing skills of the Aleut in this kayak. An ancient culture of full time paddlers on the stormiest, roughest, inhabited seas in the world. Is there any comparable source of rough water paddling skills and kayak design? No. Few recreational kayak paddlers will push the limits of a design to truly understand the differences and complexity of hull shape. My years as a white water paddler were very enlightening and instructive in this aspect. Please look at my designs, read the information I provide, read the testimonials on my site and call me to talk to me personally, so I can suggest a boat for your needs and skills. Laughing Loon was the first to build a hard shell baidarka and is still the only company, offering the Aleut "baidarka" style sea kayaks as a "stripper". I had the good fortune to hear George Dyson speak at the Maine Maritime Academy in 1992 on the "baidarka" style sea kayak. He made some astounding claims about the outstanding sea worthiness and speed of the baidarka design, in six hours of presentations!!! I was paddling solo whitewater boats at the time and immediately noticed the similarity between the high volume and full stems of then current whitewater boats, and the Aleut baidarka. I realized these baidarkas were designed for big waves and rough water! I built the first North Star baidarka in 1993. I have since found the baidarka design to be the the fastest, most sea worthy kayak I have ever paddled! I have had many calls and letters from owners and builders of my baidarka designs, tell me the same. I have also had my baidarkas called the "surf board you sit in", for their outstanding surfing characteristics. Read a review of one of my baidarka designs. Light-weight is the first priority in my designs. I've spent many years portaging heavy canoes in Northern Ontario. I dreamt of a canoe so light-weight that I could carry it and a pack in one trip. This started me down the path of my light-weight quest. An added benefit of having a light-weight boat, one I had not realized, is the improvement in performance. A light-weight boat is much more responsive to strokes, making it easy to paddle and quick to turn and maneuver. Of course, every racer knows this and strives to reduce weight. A light-weight boat is also easy to put on a car and carry to the water, a feature that ensures the boat will be used often. Think about going paddling and there is nothing stopping you! My sea kayaks range in weight from 30 to 40 pounds depending on size and outfitting. This is the lightest-weight available in a hard shell sea kayak. As important as light-weight, is designing and building performance boats. By this I mean boats that take less effort to paddle and that excel at a specific purpose. I design sea kayaks that are fast and track well. And yet they turn and manuver well also. Most of my designs are "soft chine" hulls, with a rounded bottom. A soft chine, means the transition from the hull side to bottom is rounded. A rounded bottom hull has less wetted surface and is faster than a hard chine hull of the same width or beam. The more rounded the hull, the faster it will be. The trade off is that you will have less stability. Soft chine hulls ride rough waters more smoothly. True Greenland designs have hard chine hulls. A "hard chine" means the transition from the hull side to bottom is a sharp or a harder angular change. A hard chine hull is not as fast as a soft chine hull but it will have greater initial stability given the same beam. A hard chine hull with a 21" beam will feel like the stability of a 24" beam soft chine hull. I like "flare" in the sides of my kayak hulls for greater secondary stability. Flare means the sides of the hull overhang the water so as the hull is leaned to the side the hull surface gets larger creating a strong "secondary" point of stability. This flare creates an angular transition from the hull to the deck at the "sheerline". The sheerline is the edge where the hull and deck meet. When I began designing and building sea kayaks I felt I could learn some very important lessons from the lines of native kayaks. My kayak designs reflect the performance of their native sources, combined with the features recreational paddlers want. Paddlers will appreciate the great performance of these well-designed kayaks. I receive letters and email, all the time, from happy customers. I believe in the phrase," Form Follows Function", And that beauty... is the reflection and result of a well designed human object. The importance beauty has for me, is that it is the reflection of a well-designed boat. Many people talk about the spirit of wood, and how a wooden boat feels and handles like no other boat. For me, this spirit, brings back childhood memories of many happy rides in wooden boats. These are the sea kayaks designs I have to offer! From shortest to longest in length. Dark Star © above, is 15' 6" long by 21" wide Baidarka style sea kayak. 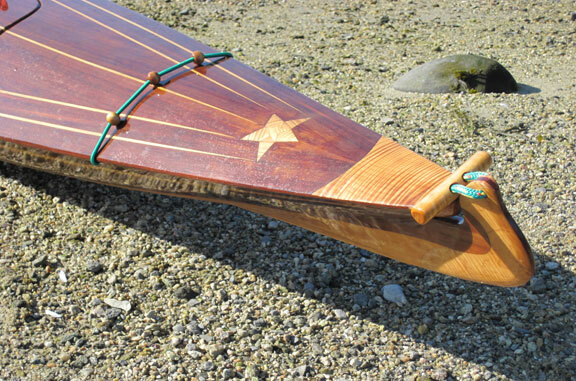 Shooting Star© is a 16' 6" long by 21" wide Baidarka style sea kayak. Twin Star© Baidarka Tandem above, is 21' long and 26" wide.